I noticed some curious things in the Mojave National Preserve while scanning Google satellite imagery. 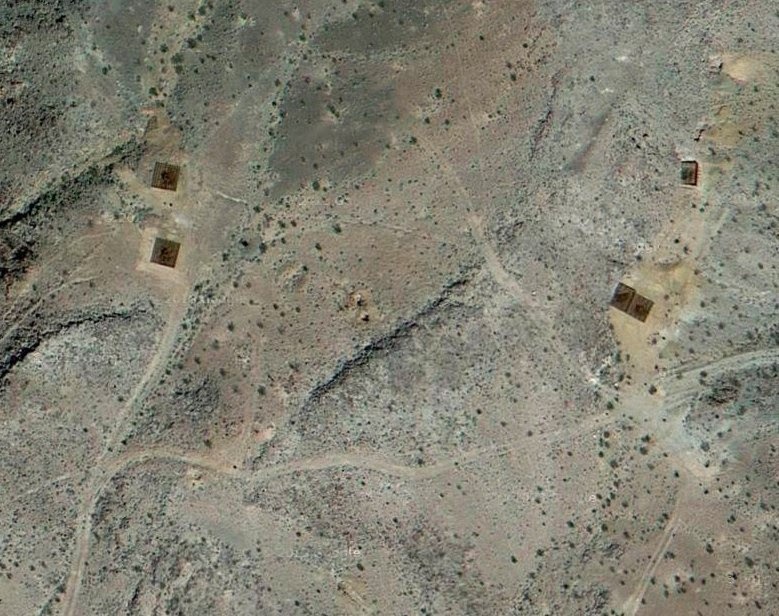 There appeared to be about a dozen very large reddish square-shaped objects. They're certainly man-made. This google map is centered on them. This piqued my curiosity, so I decided to visit the site and check them out. I drove a 2-track jeep trail that I saw in the satellite images leading to the site. You can see jeep trails coming from 2 directions in the satellite images. I took the track from the north, leaving the Mojave Road 4wd trail from a sandy wash. I had to get out and walk around to find my way, but it turned out to be easy. Here's the start of the jeep trail. The trail isn't difficult. It's a pleasant drive. The area is rocky and a little hilly, but the roads are easy to follow. Here's a shot looking northeast down the little valley with the jeep trail that I drove. Old mine openings have been covered for safety. I wasn't aware of anybody falling into these. But I remember a few years back when Senator Feinstein backed a bill to pay for this operation, protecting the public from this menace in the deserts of California. They've all got concrete foundations and steel covers. What I saw in the satellite images now makes perfect sense. This photo looks west toward Soda Dry Lake with Cowhole Mountain and Little Cowhole Mountain in the foreground, and Cave Mountain visible in the distance. really cool post I have been out there and also looked around for stuff I looked at on the maps. Interesting topic and good photos.